The question about the difference between an absolute pressure and a gauge (relative) pressure measurement always pops up every now and again. 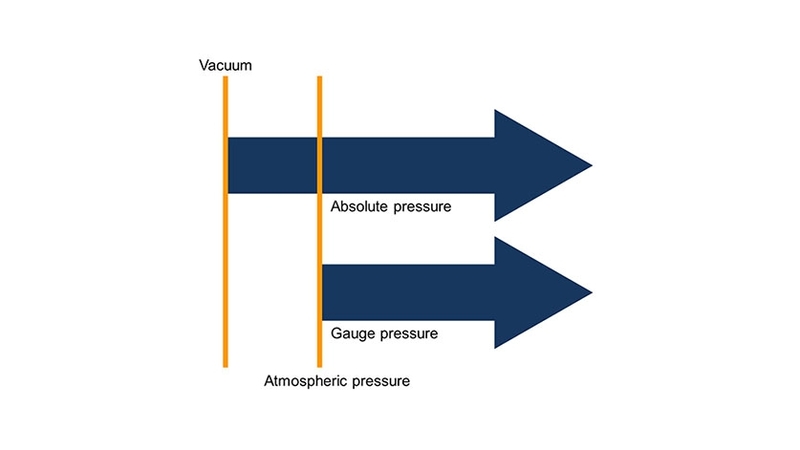 From a purely theoretical point of view, the question can be answered relatively easily: in a gauge pressure measurement (aka overpressure measurement), it is always the difference from the current ambient (atmospheric) pressure that is measured. However, this pressure changes with the weather and the altitude above sea level. On the other hand, an absolute pressure measurement measures the difference from the ideal or absolute vacuum. This is why this measurement is independent of weather or altitude. Depending on the measuring range, these errors can be substantial (e.g. in pneumatics at a measuring range of 1 bar) or negligible (in hydraulics at 400 bar). If you are uncertain whether your measuring task requires an absolute pressure or gauge/relative pressure measurement, your contact person will be glad to assist you.